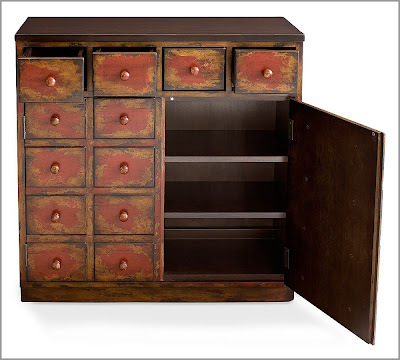 If there happens to be anyone out there who thought while reading this post (as my sister and FabulousFinishes did), "GREAT Apothecary Chest, but who the heck wants that many drawers in a piece of furniture?" ... I wanted to clarify that they there are NOT 16 drawers on this chest. There are four drawers along the top, and the others are actually cabinet doors with drawer fronts adhered to them. So it is, in fact, a FAUX Apothecary Chest. So, in case anyone was thinking about buying it if it weren't for all those pesky drawers, you are now free to make the purchase. Please send pictures of it in your house. Thank you. I would say the old joke, "you should buy stock in PB as much as you love their stuff," but...you know, don't. Righto ... if there were money for buying stock, I'd probably be buying the furniture. Before we had kids I thought she should get a job there but then I realized even with the discount she would spend more than she made.